This is something everyone should know about Excel since it both enables Excel to do lightning speed calculations and limits Excel in a great way. And the guilty party is IEEE 754. Whenever you work with large files in Excel, so many worksheets with countless formulas, you have probably wondered, how does Excel do it so fast… Well if it wasn’t for IEEE 754, it would take an eternity. But this cutting of corners or rather of numbers also has a downside. But first things first. What is IEEE 754? You will notice this standard in many ways in Excel, but the main is, that if you write an integer with more than 15 digits (which is quite feasible), excel will transform all integers starting with the 16th to zero. Adding the three numbers in A1, A2 and A3 should result in 0, but you get something else entirely different. This is due to another limitation that is a side effect of the IEEE 754 or more precisely a side effect of something that excel did not adopt from IEEE 754 and that is the “negative zero”. So when excel should give something like -0.x as a side result or as the end result, you are in trouble. With this in mind it can be said, that Excel doesn’t really calculate correctly, and if we would like to continue our journey to eternal happiness in Excel, this is good to know! The short answer is NO. The long answer is, you can store longer number s text (so begin writing in Excel with an apostrophe), and you will see more than 15 integers, but if you will want to convert them back to numbers and do calculations with them, you will again only work with 15 integers! I’m guessing you are talking about the =INT() function in Excel, which is a great way to get the integer, but does not solve the problem. if you want 1234567890.123456789 INT() will give you 1234567890 whereas Excel will give you 1234567890.123450000 which is still better, but not quite 1234567890.123456789 what we want. The problem described does not exist… The easiest solution: change format from general to number. if you format the number, so it only shows the whole number or so that it visually rounds the number on 2 decimal places, you will get 0 or 0.00 but that is only what you see. The number in the cell will still be 0.0000000000000001249 (this is from the sample in the post) and if you format it as number it will give you 0.00 whereas general would give you 1.249E-16 but still that is just formatting. You only change what you see, not what is really there. Try formatting the cell as a number but with more than 15 decimal places and you will see the problem. It’s hidden and minute, but still a hassle. A calculus that gives a result with more than 15 digits, 0 (zeros) will appear in the rest of the number. Nonetheless, the calculus is made. For instance, 2^50 = 1,125,899,906,842,624, but EXCEL gives the result 1,125,899,906,842,620. The digit closer to the decimal is “rounded” to 0 (zero). From my previous experience I have learned that it is not required. You can achieve both numbers (rounded and/or exact). When entering the number 123456789123456789, Excel is automatically set to round the last (3) digits to zeros. But if you enter the number: _123456789123456789, Excel leaves the number exactly as entered without rounding it off. If for your calculations) if you put the (_) in front of the number and do a sume of the numbers, you will achieve the exact anwser (0). you are right, you can put the number in as _123456789123456789, but that is not a number for Excel, it’s a string or text. You do get a sum of 0 but it’s because you are suming text. Try changing one of the numbers, and you will still get 0. Are there just certain combinations that create this? I’ve tried, for instance, these numbers: -1.25, +1.14, +.11. This seems to work correctly, as well as several other combinations. I’m wondering what actually invokes the trigger? If you know. I want to type two mobile numbers in one cell of the excel with this cell/display format: #####-#####, #####-##### (means one hyphen after every 4 digits). But it keeps changing the last 4 digits into zeros. What is the best and easiest way to test the 3rd decimal digit of a number to determine that the third decimal position is NOT zero. I need to know how to do this for a highly specialized rounding issue in a financial calculation. Good article, I have wondered why this is the case. As a one-off solution you can manually trim off the first digits in a single cell to expose the rest. For example “=a1/a2” shows result 0.19111111111111. I need a few more digits for a program I use so I then do the calculation “=a1/a2-0.19” which manually trims the digits in front to expose more in back. This can be useful in certain situations. I want to find exponent of 6 digits numbers eg 157864 but got #Num! error. Can anyone help on how to solve this? Try copying the below in cell B2. 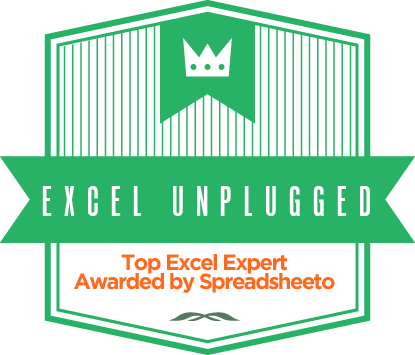 Excel Unplugged. All Rights Reserved.